The Afrikan Emancipation Day Reparations March, as the street column of the International Social Movement for Afrikan Reparations (ISMAR) is a vehicle for mass mobilisation and education as part of our self-repair and people’s power-building process. It is also a conduit as part of an on-going parliamentary and extra-parliamentary strategy, hence the delivery of the ‘Stop the Maangamizi: We Charge Genocide/Ecocide‘ Campaign (SMWeCGEC) Petition charging the British State with the crimes of Genocide and Ecocide and demanding an end to their role in the continuing Maangamizi. The Afrikan Emancipation Day Reparations March Committee (AEDRMC), in association with the SMWeCGEC, will continue the year long process of march planning, mobilisation and organisation alongside its ‘Education is Part of the Preparation for Reparations‘ programmes in preparedness for the establishment of All-Party Parliamentary (People’s) Commissions of Inquiry for Truth and Reparatory Justice (APPCITARJs), also contained within the SMWeCGEC Petition. Given that the AEDRMC as facilitators of the annual 1st August Afrikan Emancipation Day Reparations March organising process in partnership with the SMWeCGEC are in pursuit of comprehensive holistic land-based reparations. This means our reparations as Afrikans in the Diaspora is umbilically connected to the liberation of our Motherland Afrika, restoration of her sovereignty and the self-determination of Afrikan people worldwide including the establishment of forms of non-territorial forms of autonomy in the Diaspora. We are working for the achievement of the kind of reparations that we can ALL be truly proud of. This is necessary to ensure that all of our people, (not just a few) get ‘satisfaction’ out of the results (that also includes our predecessors, our contemporaries and our posterity, i.e. those yet to be born). MAATUBUNTUMAN: Pan-Afrikan Union of Communities throughout the Continent and Diaspora of Afrika expressing Maatubuntu dignity integrated into a holistic global superpowerful polity of Maat which practices Ubuntu in relation to her people, all of humanity and the cosmos. AHC-NSDs seeks to strengthen links with similar communities of resistance in contested and liberated zones (as explained by Osagyefo Kwame Nkrumah) on the Continent of Afrika. Doing this is also in line with the imperatives for us as Afrikan people coming out of the BREXIT crisis in Europe, necessitating a Pan-Afrikan reparatory justice response by way of a PAFREXIT. By PAFREXIT we mean, the Pan-Afrikan exit out of the global system of Euro-Amerikkkan imperialism! The more people in Europe find it difficult to endure the systemic malaise of their own European Union, as much as increasing numbers of people in North Abya Yala, (the so-called USA), are crying about the ‘American dream’ becoming more of an ‘American nightmare’, the more it becomes untenable for Afrikan people to work for their salvation as an integral part of the Euro-American Empire. So, PAFREXIT becomes necessary for Afrikan people getting out of the Babylon of Euro-America and stepping towards our MAATUBUNTUMAN: Pan-Afrikan Union of Communities throughout the Continent and Diaspora of Afrika expressing Maatubuntu dignity integrated into a holistic global superpowerful polity of Maat which practices Ubuntu in relation to her people, all of humanity and the cosmos. Whilst everyone is free to choose their own path, those who want and are committed to achieving this holistic and transformative kind of reparatory justice for our people (and not just for us as individuals and parochial groups committed to the status quo), in the quickest possible time, are called upon to work their hardest in educating, organising and mobilising around these tasks of everyday resistance and transformative people’s power-building. This can be initiated as part of the various local and regional March Outreach Teams and Task Action Groups operating under the auspices of the AEDRMC and in support of the March in addition to the SMWeCGEC as an integral part of the ISMAR. The Afrikan Emancipation Day Reparations March is not just a March, it is organised to advance reparations social movement-building of various constituencies within the Afrikan Heritage Communities. Priority is given to mobilising our own individual and collective ‘power to’ effect and secure reparatory justice through community organising, reparations social movement-building and institution-building. Social movement-building is the long-term, coordinated effort of individuals and organised groups of people to intentionally spark and sustain a (reparations) social movement.It entails: “the creation of movement infrastructures required for sustained organising and mobilisation, including social relationships, organisational networks and capacity, affective solidarity, as well as movement-related identities, frames, strategies, skills, and leadership.” There is a difference between organisation/institution-building and social movement-building, see here for an explanation. See here for what has been achieved thus far after 4 years of marching. Adopt the reparations ethics standpoint of recognising and learning to discern and distinguish between the various contributions that others have and are making to reparations-social movement-building, from many different ideological persuasions, and organising traditions. In the same way that we may critique the actions of others, we too must be prepared to have our own reparations actions, (be they individual, organisational/institutional or inter-movement), subjected to scrutiny in the best interests of improving the focus and effectiveness of our move-ment-building endeavours. This struggle for reparatory justice is an intergenerational one. We stand on the soldiers of many greats from among us past and present who have individually and collectively played their role in the line of March. Ossie Davis‘ words below are relevant to us all in seeing ourselves as part of the continuity of our intergenerational long March to the true freedom that Reparatory Justice will give all of us. Defend the integrity of the March which is a people’s reparations march. 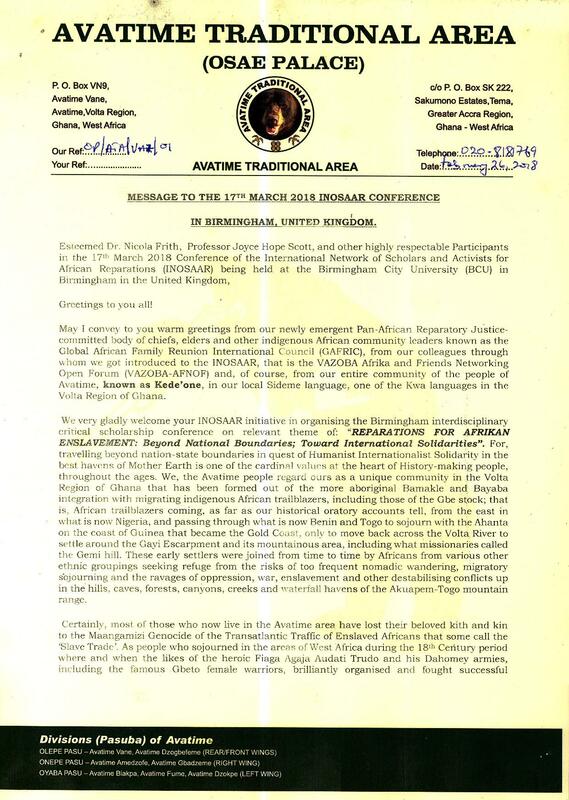 Many from within and outside our Afrikan Heritage Communities and even from within some Afrikan Reparations Communities of Reparations Interest and their allied organisations, networks and structures have made various attempts to liquidate the March, to counter it and deny its role in ISMAR-Building. 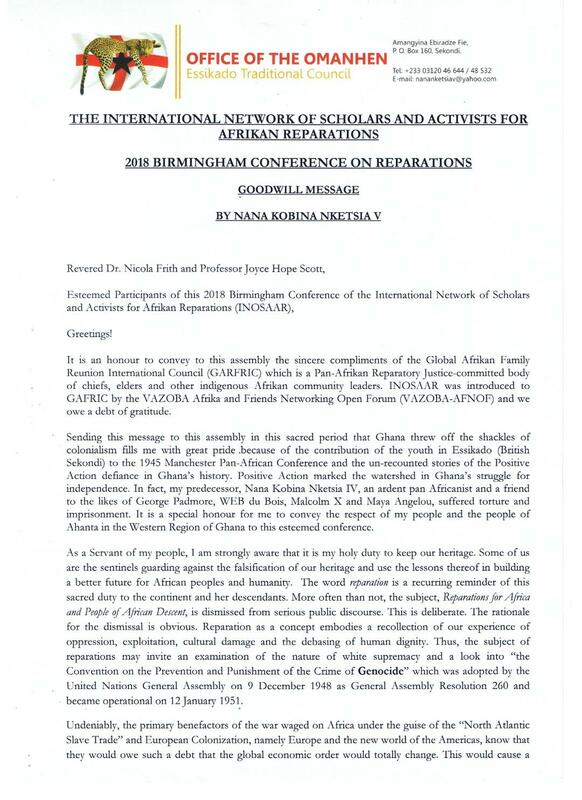 Others have sought, in various ways and means, to diminish the significance of its contribution to raising the visibility and profile of the UK contingent of the ISMAR, which those ordinary members of the Afrikan public who contribute to organising and providing community service in support of the March, have been labouring to achieve. 3. Amplify the voices and defend the actions of those members and groups within specific Afrikan Heritage Communities and our various and diverse communities of reparatory justice interest who are engaged in civil disobedience and taking forms of direct action to shut down ‘Maangamizi Crime Scenes’ in Afrika and other locations in the Afrikan Diaspora. It is also important to support Afrikan liberation movements in Afrika and wherever they are found in the Diaspora, including those with operation in the UK. crimes against humanity inherent in the wars of aggression and proxy wars committed against Afrikan and other Majority World Peoples. 5. Keep in touch with the AEDRMC and listen out for announcements about the Public Evaluation Meeting on Sunday 3rd September 2017 (venue to be confirmed), when we would like to here from you your feed-forward (reflections on and community evaluation of) the Afrikan Emancipation Day Reparations March. We would also like to hear more about the work you are doing towards effecting and securing reparatory justice, remember it is not either or, but both and much more! These blocs will continue to operate, mobilise and organise throughout the year as part of reparations social movement-building, at the core of which is the intergenerational Afrikan Liberation Movement. If this bloc-building work is sustained between the Marches, the annual Reparations March then becomes the culmination point of our year round reparations campaigning and other forms of activism, in addition to being a vehicle for publicly showcasing the strength of our organising, networks and capacity-building to advance the ISMAR. Participate in the Mwakalenkonso (Revered Ancestors) Bloc by coming to the March appropriately dressed as or otherwise symbolically representing a heroic ancestor from your own family line or a community Ancestor who has in some way been involved in resistance to the Maangamizi or advocating some form of reparatory justice. We must always remember that our people’s claims and right to reparations are based on the principle of intergenerational justice and therefore have transgenerational, transnational and intercultural dimensions. By appearing on the March visually representing or otherwise imaging revered Ancestors, one will be doing so in remembrance, honour and recognition of the interconnectedness of our Ancestor’s foundational struggles to resist the Maangamizi with our own. 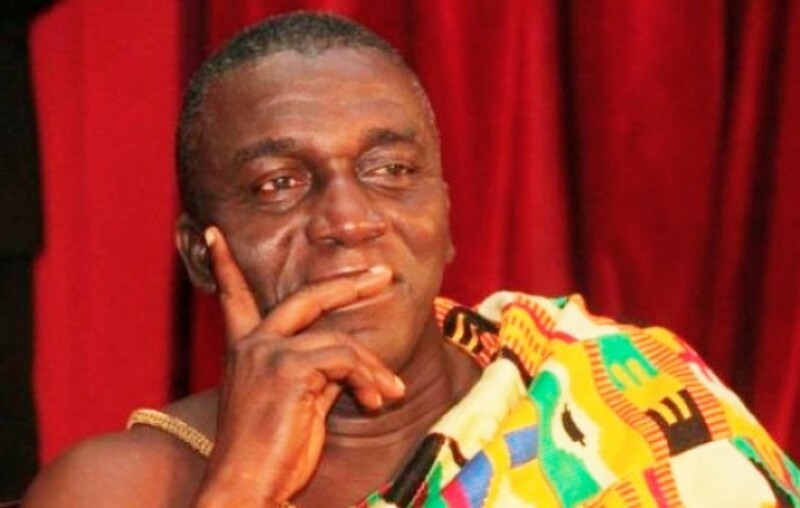 This will not detract from the serious nature of the protest that we will be undertaking, however does introduce a more creative element to protest actions that are typical of marches and other forms of street action. Claims to reparations have to move beyond merely calling on the name of our Ancestors as justification for the genesis of our entitlements to redress today to truly recognising the personhood, worldviews and visions of reparatory justice of the Afrikans that were enslaved in various parts of the world. In addition, we have a duty to past generations and future generations to ensure that our reparatory justice objectives, programmes and actions bring about the holistic and transformatory redress; empowerment, repair and restoration of our people’s sovereignty. Being visually reminded of our Ancestors activism and struggles to emancipate us compels us to uphold the reparations ethics and standards of the past generations of our clan, family, or community freedom-fighters. You can organise a church service for ‘Reparations Sunday’ on the second Sunday, or the Sunday closest to 12th October, the European Union (EU) Day for Reparations Related to Colonisation. If you are part of another faith community then you can organise a similar activity on your preferred day of worship closest to 12th October. This action is particularly relevant for people who are interested in building the Imani-Interfaith Bloc of the March. You can add your creative talent to producing art forms which popularise and promote the messages of the ISMAR. 7. Continue to do as much as possible to educate yourself and your families about reparations, the history of the Movement, the diversity of the Movement, the goals, tactics and strategies of the Movement, even the internal contradictions of the Movement. One of the best ways apart from increasing your theoretical knowledge base is to engage in praxis (a cycle of theory, action and reflection that helps us analyze our efforts in order to improve our ideas) and action-learning (learning through doing). Theory without action and testing out that which we have theoretically learned produces armchair critics and/or revolutionaries. However, action without reflection produces ineffective or counter-productive activism. That’s why we advocate praxis. To assist in this process, we encourage you to look at some of the suggestions made under the ‘Take Action’ tab on the SMWeCGEC website. This is a short article about the importance of learning within the ISMAR: https://reparationsscholaractivist.wordpress.com/2015/05/13/learning-and-education-for-a-post-african-reparations-world/. 8. If you are part of an organisation, or work add a specific reparations objective to your organisation’s aims and work on its practical realisation. 9. Engage in discussions with the support the SMWeCGEC Team on how best to support the SMWeCGEC in the realisation of its campaign goals which will take year-round activism. See if there are any of these actions that you are willing to take. 10. Continue to sign, discuss and disseminate the SMWeCGEC Petition which calls for the establishment of a UK All-Party Parliamentary Commission of Inquiry for Truth and Reparatory Justice (APPCITARJ). This petition is being used as a political tool and tactic to accompany reparations conscientisation, mobilisation and organisation. 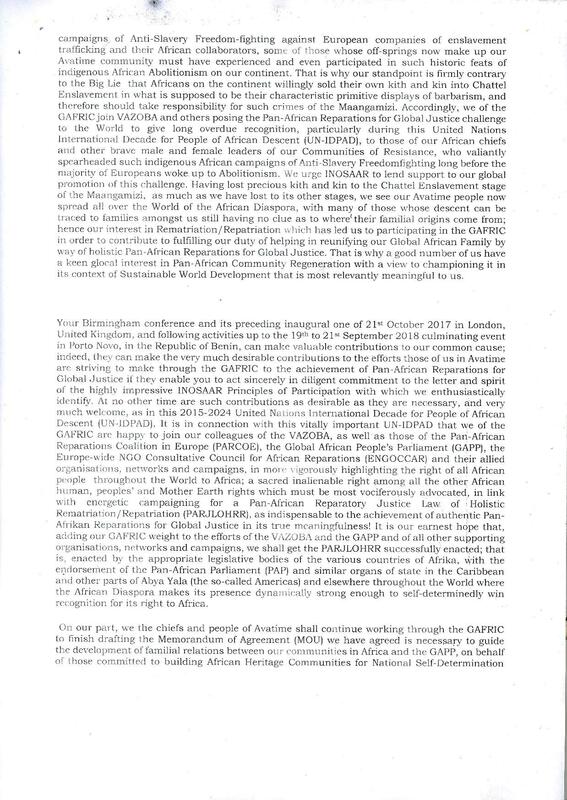 Afrikans in the UK and Europe organising towards establishing commissions of inquiry for truth and reparatory justice and local, national and international people’s tribunals to hold the governments of Britain, and other European countries to account. If you are able to gather such evidence you can assist us to arrive at a comprehensive assessment and a full picture of what our journeys and experiences of the Maangamizi have been across the Diaspora, as well as on the Continent of Afrika. Each person and representative of families and their communities have to become our own advocates and experts on your own situation and then we can bring all these experiences together as part of us becoming ‘reparations enforcers’ who are building the power and capacity to hold to account all those who are continuing to profit from the ill-gotten gains of the Maangamizi and are also complicit in its perpetuation today. See the video below from the documentary ‘Freedom Summer’ for some AAPCITARJ lessons from our Shero Fannie Lou Hamer. Hamer’s testimony had such a huge impact upon the government and public in and outside the USA, and was so powerful, that President Lyndon B. Johnson called an impromptu press conference to get her off the air. This is a recording of the full testimony and also a transcript of that testimony. Her testimony provides an example of what we envisage could be the impact similar ISMAR-coordinated grassroots testimonies by our Afrikan Survivors, Resistors and Challengers of the Maangamizi, from all over the World to the APPCITARJs in the UK Parliament of Westminster and the European Parliament. We surmise that the ‘holding to account’ referred to above can best be done in a collective way by supporting the establishment of the Ubuntukgotla, court of peoples humanity interconnectedness, otherwise known as the Peoples International Tribunal for Global Justice (U-PITGJ), which we encourage you to support the development of. This can be done through hosting sittings of the tribunal, locally, nationally and internationally. If you would like to know more about the APPCITARJ/U-PITGJ contact PARCOE on info@parcoe.com or 07751143043. As part of the rationale for this approach, it is important to have a better sense of the historical antecedents of the SMWeCGEC in the UK, see these historic recordings from 2003 of Esther Stanford-Xosei speaking about the 2003 Black Quest for Justice Campaign (BQJC) legal & extra-legal strategy for reparations; the need for a UK commission of inquiry to address the legacies of the Maangamizi (Afrikan hellacaust of chattel, colonial and neocolonial enslavement); and the commencement of the UK version of the ‘We Charge Genocide petition and campaign’ under the auspices of then then Black United Front-Parliament (BUF-P). 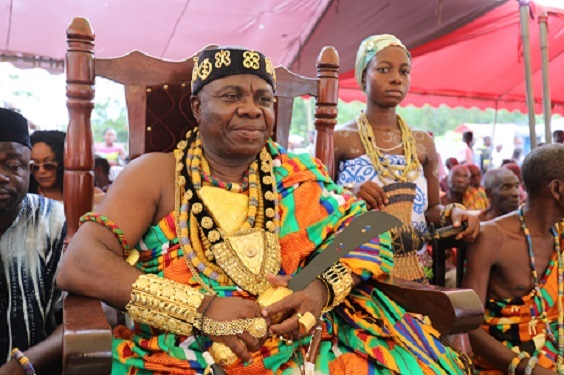 The second set of videos where Stanford-Xosei is interviewed, precedes in order and time the first video where Stanford-Xosei is speaking to camera. 12. Set up a MAATZOEZADUARAs (i.e. Maat action-learning circles or ‘Maat Training Practice Rings’) which is a reparatory justice circle of Maat practitioners who learn to be the self-repairs change at the levels of their person, home, family, neighbourhood, workplace, school, places of leisure and worship, etc. These Maat Training Practice Rings encompass a number of families and lineages, across geographical boundaries and generations. For example, a home or family based Maat Training Practice Ring will entail getting a selected number of people in your family interested in unravelling family histories and using this knowledge to recognise and gather evidence of the harm that has been done to you as a family. the Practice Rings will also explore how such harms have been passed down throughout the generations, resulting in increasing levels of disrepair. We are looking for case studies of some of these family stories documenting family member’s lived experiences of the Maangamizi and resistance to it. This unravelling of these stories is part of the process of repairing the harm and continuing damage being done within our own families. 13. Creatively utilise SMWeCGEC Petition Soulsquestathons (SMWeCGE-PS), which is literally a collection of souls, for spark-rippling MAATZOEZADUARAs. 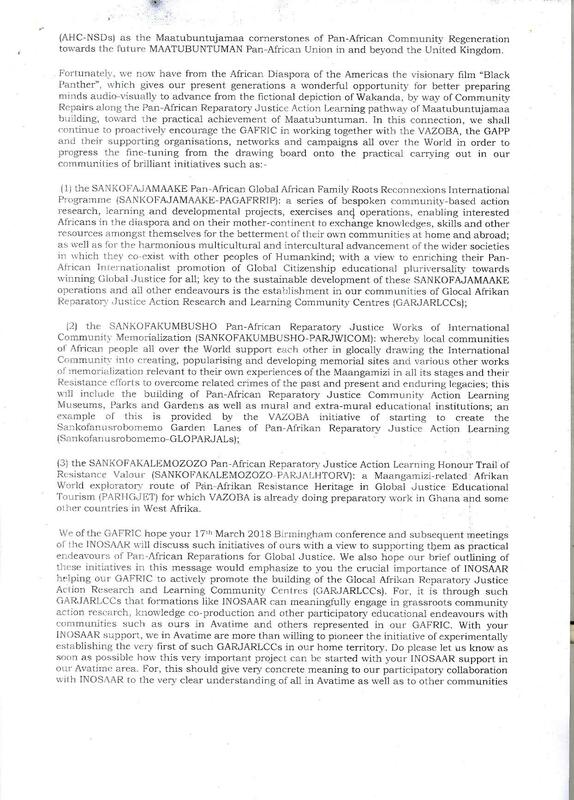 The aim is to link chains of MAATZOEZADUARAs together encompassing a number of families, across geographical boundaries and generations, all over the place, as Grassroots Afrikan Reparatory Justice Action Learning Praxis Exercising Rings (GARJALPERs) of the U-PITGJ. This means that they will share their stories and practice not only testifying with these stories but also putting their cases through trial rehearsals. The key point about the Soulsquestathons is that the various participants connect to, compare and contrast their self-repairs reparatory justice work as families within these MAATZOEZADUARAs. Basically, these are intergenerational connections, not only of family members of the present, but also the past. It therefore becomes necessary for us to keep records about and bring the lives and work of our revered Ancestors into our everyday lives of the present. It is important to see ourselves as belonging to an intergenerational continuum of Survivors, Resistors and Challengers of the Maangamizi that unless it (the Maangamizi) is stopped, will stretch indefinitely into the future. We are reminded that our society today is not merely an association of contemporaries, it extends forward and backwards in time and encompasses our family members and people of the past who sought to provide us with a just inheritance, as well as those entities who unjustly conspired to deny them their rights to pass on the fruits of their labour and sacrifices, thereby denying future generations their rightful inheritance. As Afrikan liberation leader Amilcar Cabral reminded us, “As Afrikans we firmly believe that the dead continue to walk beside us. We are a society of both the living and the dead.” Our society also consists of people of the future who will inherit what we have achieved, good and bad as well as what we have failed to redress and repair. In our justice-seeking endeavours we remain duty-bound to our revered Ancestors on whose behalf we act today, as the temporary caretakers of lineages and prosperity. The work we can do within our own families, the SMWeCGE-PS sparkrippling and proliferation of MAATZOEZADUARAs, are the first strides of ‘Global Afrikan Reparations How Steps of Positive Action’ (GARHSOPA), which can be taken by Afrikans and all people of Afrikan heritage everywhere. This speaks to positive action steps as part of a process or methodology for moving beyond making a demand for holistic reparations to seeking to enforce such demands. This is done by us building the power and collective capacity to effect and secure reparatory justice, starting with personal and interpersonal change collectivized until it contributes to social change. Positive action therefore refers to the adoption of all legitimate democratic means by which we can cripple the pro-White supremacy forces of European imperialism and similar powers, from within and outside our communities, obstructing the free exercise of our right to effect and secure reparatory justice, by any means necessary, for ourselves. (3) the democratic exercise of our rights to protest, to organise agitational rehearsals of our people’s reparatory justice case through the MAATZOEZADUARAs as part of the process of establishing the U-PITGJ and pressurising the establishment at UK and European levels, resorting to various actions of non-cooperation and civil disobedience, such as the application of strikes, boycotts, occupations, declarations of expropriation of the expropriated etc. based on the principle of non-violence and organising constitutionally towards participatory democratic ‘upstandings’. 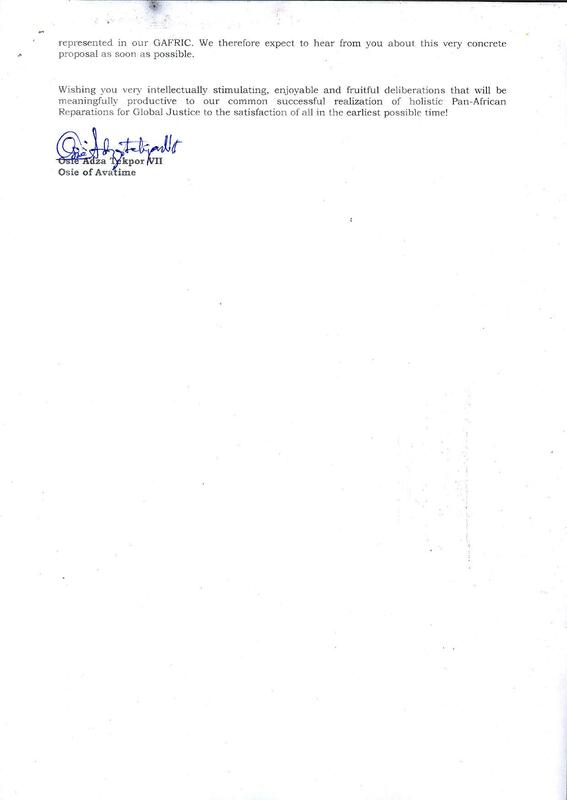 There must be clearer overstanding of the signing of the SMWeCGE Petition in a “Soulsquestathon” as meaningful only when a signatory proceeds not only to promote the diligent comprehensive study of its contents to encourage participatory mass education, but also the use of the contents for the glocal practical training and rehearsal of court proceedings in his/her home, workplace, spaces of worship, leisure sites, etc., of our Global Afrikan Family Case for Holistic Reparatory Justice, as it ought to be heard by the future U-PITGJ. Likewise, the MAATZOEZADUARAs should also be utilised to very well prepare, by way of rehearsals and other training and educational practices, e.g. ‘SoulTruth Barings’, (where we bear our soul truthfully), and other kinds of presentations to parliamentary commissions of inquiry at local, national and international levels by Afrikan Heritage Community groups and individuals, as well as interested others from diverse communities, who desire the truthful public telling of their own germane personal, family and community stories relating to the Maangamizi. The creative popular democratic utilisation of the SMWeCGE-PS, in propelling the mass educational wide-spreading of the MAATZOEZADUARAs, ought therefore to be the kickstarting point for conscientisational agitation in stepping forward towards various self-empowering measures of self-determination to effect and secure holistic reparatory justice, by our own sovereign Afrikan people’s power throughout the continent and Diaspora of Afrika. The MAATZOEZADUARAs are extremely important in ensuring that we proceed in our pursuit of reparations mindful of the fact that the claims and case of Afrikan reparations are based on the principle of intergenerational justice and therefore have transgenerational, transnational and intercultural dimensions. The point about any struggle including the struggle for reparations is that it comes with its own heritage, knowledge foundations and social justice traditions. So those of us in this generation who seek to be integrated into the ISMAR should not pretend as though we are coming with new ideas which have not been forged at the heart of our Afrikan and Diaspora communities of resistance seeking to reclaim our true sovereignty, wealth, livelihoods and custodianship of and the ‘right to belong’ to our Motherland and benefit from the resources generated from such land. As the descendants and heirs of Afrikans, some of whom were martyrs, that were enslaved in previous phases of the Maangamizi, we are mindful of our ancestral responsibility to ensure that when we speak in their names we do not allow our enslaver’s visions of justice to prevail in advocating what are considered to be adequate reparatory justice. The discourse on reparations therefore has to move beyond merely calling on the name of our ancestors as justification for the genesis of our entitlements to redress today, to truly recognising the personhood, worldviews and visions of justice of our Afrikan predecessors that were kidnapped, trafficked and enslaved in Abya Yala (the so-called Americas, including the Caribbean). We have to remember that they were sentient and rational human beings who lived under conditions in which that humanity as well as their Afrikan personalities, legal and political heritages were denied. It is no longer tenable to assume that the practice of law was alien to Afrikan peoples prior to chattel enslavement and colonisation and they operated on the basis of cultural, legal and political logics of their own. To give primacy to their enslaved status and legal and justice frameworks of their enslavers and their descendants continues their deracination, invisibilisation and dehumanisation. According to Jurisconsult, Kofi Mawuli Klu, the use of law is one of the most important instruments of our Afrikan struggle for reparations. For Klu, the need to locate our claim to restitution for the damages caused by gross violations of Afrikan sovereignty raise for us the essential questions of whose framework, whose law and whose justice? Such an approach of social justice/community/movement lawyering includes recognising how Afrikans have and continue to exercise legal agency, define law, assert alternative conceptualisations of law and legality in addition to how resistance to unjust laws contributes to the everyday legal meaning-making and justice restoring practices that we engage in. Albeit that there are different legal models as to how to use law to create the desired reparations outcomes that we seek to achieve, the idea that reparations will ultimately be something that will be ‘won’ in a European court of law by ‘hot shot’ lawyers needs to be re-evaluated in the face of what reparations social movement history reveals. In the view of the SMWeCGEC, and its related organisational pillars, justice for Afrikan people, our ancestors and the required legal transformation to ensure it can only really happen with the political education and mobilisation of large numbers of people to challenge the systemic and structural legacies of Afrikan enslavement, colonialism and neo-colonialism. Such collective action must ultimately disrupt the Eurocentric norm of lawyers being seen as saviours or gatekeepers and seek to exceed the limits of existing law by forcing progressive change through direct action. This requires utilising legal advocacy to build and mobilise the power and leadership of grassroots communities. It does not come from the top-from legal, political or academic elites assuming that it is their ‘brain power’ that will result in a negotiated settlement or simply receiving pay-outs through legislation or courts. In fact, there are multiple tactics that social justice lawyers genuinely working to advance the cause of reparations can engage in to support the goals of the ISMAR. Accordingly, we take the view that by charting and combining an Afrikan self-determined path of ‘legal’ recourse and struggle for reparations and community organising, it is possible to effect and secure reparations holistically defined as part of a broader social change strategy generally referred to as ‘social justice’ ‘community lawyering’ or ‘movement lawyering’. Community lawyering encourages lawyers to critically and creatively examine non-traditional forms of advocacy such as community organising and other grassroots actions as a way of addressing the unmet legal and non-legal needs of clients and stakeholders of strategic litigation. This entails engaging lawyers and other law and justice practitioners who are willing to de-emphasise litigation as the primary tool for advancing reparations goals and outcomes at the systemic, group and systemic level. The role of a “community lawyer” also includes working in partnership with community ‘clients’ and utilising multiple forms of advocacy, including community organising, litigation, media events, community education workshops and public demonstrations to address their individual, group as well as systemic outcomes. Movement lawyering is a type of community lawyering whereby lawyers work in partnership with social movement organisations trying to bring about reparatory justice social change. Such lawyers work with organisations within a Movement to build their ‘agency‘, rights awareness and take back their power in the process of building a sustainable reparations movement. It follows that in building our family cases as part of our Global Afrikan Case for Reparatory Justice, we have a responsibility to future generations to ensure that the decisions we make today do not negatively impact the interests or well being of the unborn and each generation to come. All of these factors should be prime considerations in establishing MAATZOEZADUARAs. If you would like support or further guidance on setting up a MAATZOEZADUARA or initiate any other action, you think appropriate at your own individual or group effort towards reparatory justice positive action, then you can seek assistance from the OSORJALs (Open Surgeries of Reparatory Justice Action Learning) of PARCOE https://www.facebook.com/parcoeinfo, email info@parcoe.com or call: 07751143043. 14. Help us gather evidence of and document the Maangamizi (hellacaust of chattel, colonial, and neocolonial forms of enslavement) as well as resistance to it, as it is genocidally and ecocidally impacting on our various Afrikan heritage communities today. In this regard, please share such knowledge and experiences with the SMWeCGE Campaign. Gathering such data is essential because we are building a dossier of Maangamizi crimes and resistance them in the modern era. We aim to produce a version of the original 1951 We Charge Genocide Petition edited by Afrikan American communist lawyer William L. Patterson which documents the various manifestations of genocide against Afrikan Americans in the 1940s and 1950s. This document will provide undeniable evidence of the Global Afrikan Family Case for Holistic Reparatory Justice citing the various contemporary manifestations of genocide and the ecocide that we and our lands and environment are being subjected too. 15. Do what you can to implement relevant aspects of the ‘SMWeCGE Guidance For Proposals on Parliamentary Actions‘ including the Stop the Maangamizi Postcard Campaign which targets MPs for action towards establishing the APPCITARJ. 16. Vote in accordance with pro-reparations choices of candidates for elected public offices, lobby elected public officials to support reparations and the establishment of the UK APPCITARJ as contained in the SMWeCGEC Petition. For support in taking this kind of action visit https://globalafrikanpeoplesparliament.org/policy-positions/. 17. Begin speaking with family members, friends or colleagues about getting involved with the March & SMWeCGEC organising processes. You can start thinking and preparing for getting a group of you to attend the 2018 1st August Emancipation Day Reparations March from Windrush Square (Brixton, London) to the Houses of Parliament. 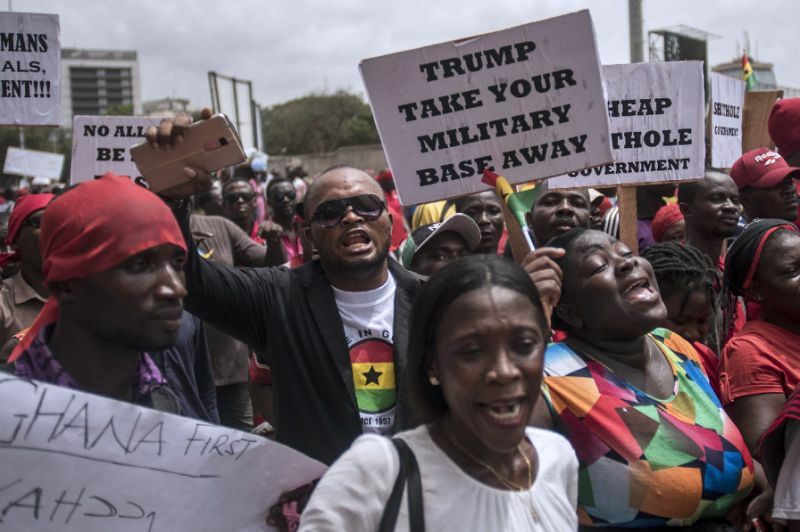 Simultaneous marches take place in Afrika, the Caribbean and so-called North America. Students are encouraged to come on the March with placards addressing the Afriphobic and anti-Black racism they suffer in their institutions and the activities they are carrying out to resist their unjust situation and effect institutional change. 18. Organise local, regional and international Reparations March Outreach Teams between the Afrikan Emancipation Day Reparations Marches to continue the street education and mobilisation work for reparatory justice for more info about how to go about this and ‘Education is Preparation for Reparations’ teach-ins and workshops please contact: education@reparationsmarch.org or call 07922035446/ 07597592889 . 19. Start rehearsing arguments in support of reparatory justice for the People’s Open Parliamentary Session on Afrikan Reparations (POPSAR), which was first introduced as a feature for the 2016 March. The POPSAR is a mass concientisational forum for public debate and discourse on Afrikan Reparations as a matter of critical social importance. The purpose of the POPSAR is to engage audiences in action-learning on participatory democratic parliamentary debate on critical issues such as Afrikan Reparatory Justice. Each year a different reparations related motion will be debated and people are encouraged to engage in practical rehearsals in preparation for the annual POPSAR on 1st August which takes place as part of the programme for the Afrikan Emancipation Day Reparations March. 20. Join the ARTCoP which promotes the development of grassroots scholar activists on reparations and harnesses the co-production of activist and other forms of knowledge between advocates, activists and academics on reparations. To contact ARTCoP email: artcop.edu@gmail.com. 21. Among the opportunities that the ARTCoP can open for interested participants in its activities, is training to become a volunteer researcher or advocate for the APPCITARJ and/or the U-PITGJ. 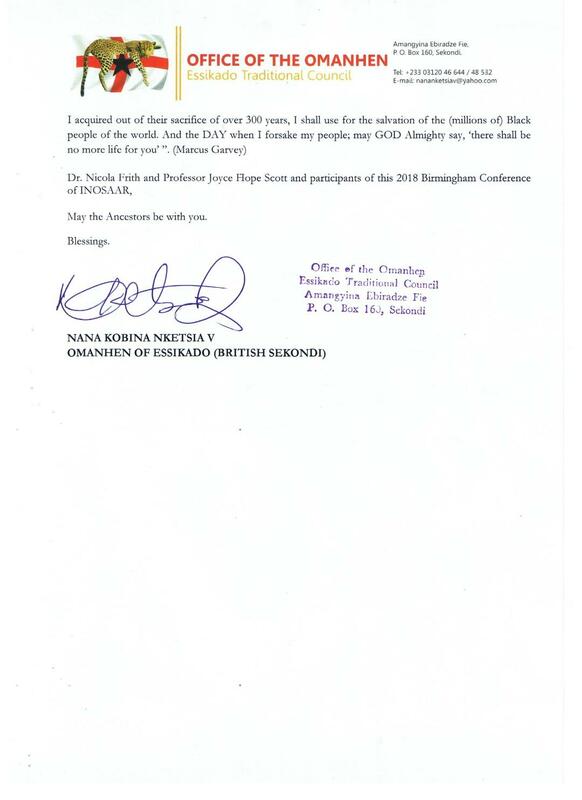 This will be particularly beneficial to participants of the Sankofasuafo – Students Bloc of the Afrikan Emancipation Day Reparations March who would like to keep themselves engaged with grassroots scholar-activist work and activities relevant to their normal academic studies in between the annual 1st August Afrikan Emancipation Day Reparations Marches. 22. For more info about the reparations activist research, (PhD in history at the University of Chichester), that is being undertaken on the history of the ISMAR in the UK and other matter relevant to reparations learning, advocacy and scholarship please visit: https://reparationsscholaractivist.wordpress.com/about/. Help to internationalise the cause of reparatory justice! 23. Contribute to the development of the Europe-wide NGO Consultative Council For Afrikan Reparations, (ENGOCCAR) and its work programmes including signing its various European language versions of the SMWeCGEC Petition in Europe addressed to the European Parliament. For further info contact engoccar@gmail.com or UK representative organisation, PARCOE or email info@parcoe.com. Get involved with the relevant programmes and activities of the Global Justice Forum, (GJF), you can email: gjfgong@yahoo.com and the Intercommunity Forum for Lifelong Learning carat.cafa @gmail.com. Mobilise and self-organise your own reparations struggles as part of the Peoples Reparations International Movement (PRIM), i.e. the reparations movement that consists of all other people’s reparations causes and find common cause with those of us in the ISMAR. This can be done by bringing along your allied progressive forces into exploring the building of neighbourhood renewal Communities of anti-racist resistance that share joint combativeness against Afriphobia and all other forms of racial discrimination as well as commonalities of Reparatory Justice interests strongly enough to forge mutually self-repairing bonds of decolonizational restitution under the banner of the PRIM. 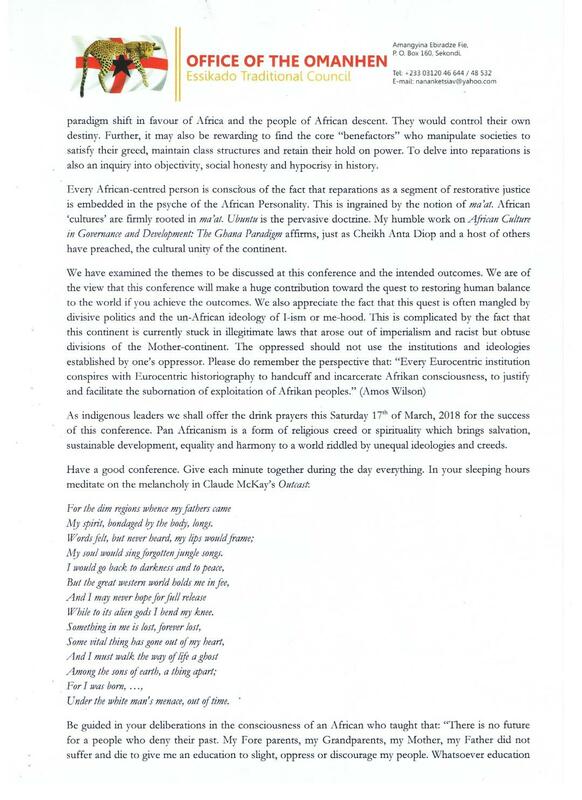 Kofi Mawuli Klu ‘Charting an Afrikan Self-Determined Path of Legal Struggle for Reparations’, a draft paper for presentation to the 11th December 1993 Birmingham Working Conference of the African Reparations Movement, UK, 1993.